SHELLEY FC was founded in 1903. For much of their history, they played in the Huddersfield & District league. 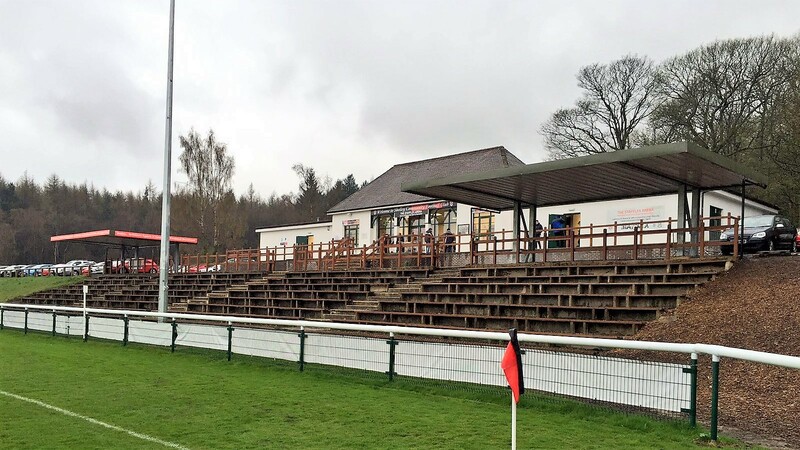 But upon acquiring a new ground in 2011 they joined the West Yorkshire League and have seen a rapid rise ever since. 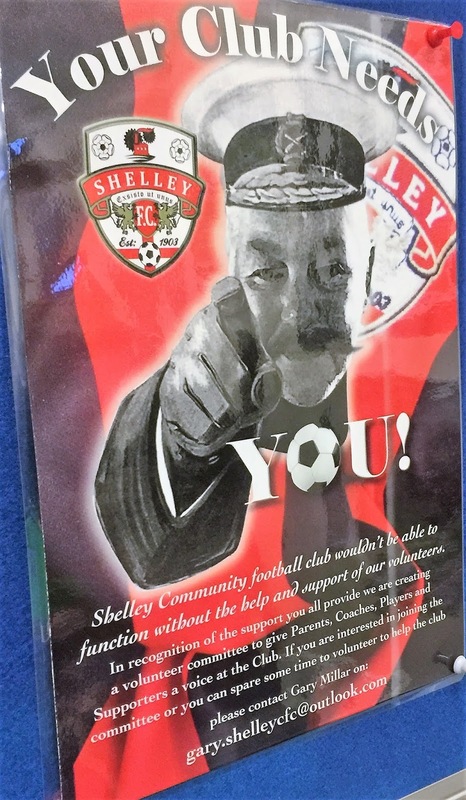 Starting in the West Yorkshire Division 2 (which sits at level 13 of English football) they were Champions in their first season. The following season saw promotion achieved too as they finished runners up to Hunsley, the team they had pipped to the title the previous year. 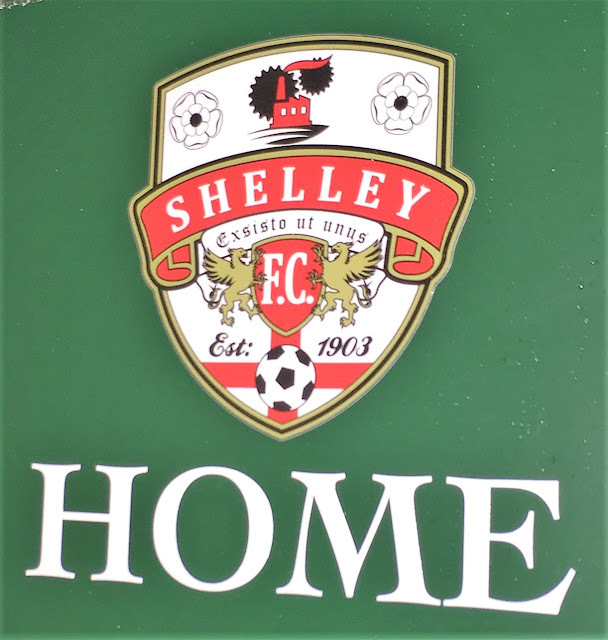 Since 2013 they have been in the West Yorks Premier with finishes of 12th and 10th in their first 2 seasons. 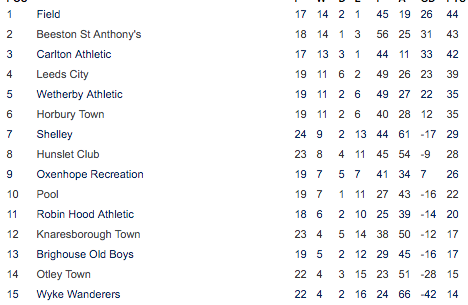 They were looking to improve that this season, sitting in 7th place and were looking to apply to join the Northern Counties East League in the future. In terms of cup competitions, the Huddersfield based Groom Cup has been won on 3 occasions, most recently in 2011. 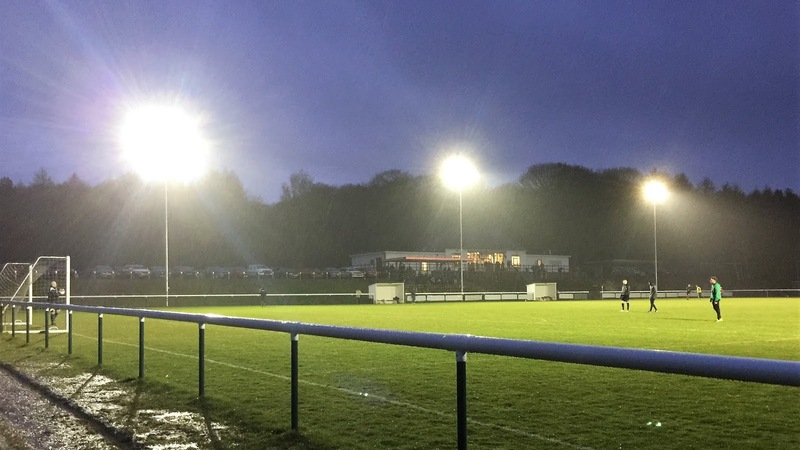 To get to tonight's semi-final they'd beaten Woodale Wanderers 8-0 in the first round before overcoming Heywood Deaf Centre 7-0 in the next round. 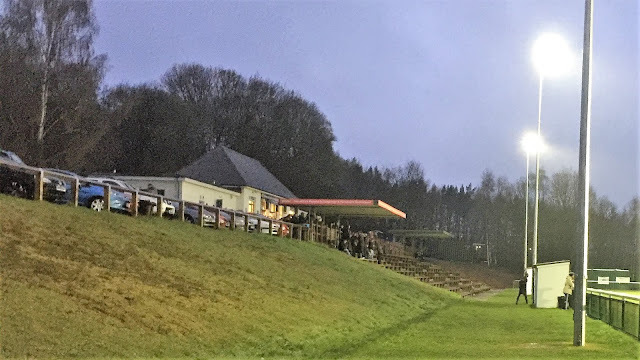 The quarter-final saw them defeat Holmbridge to face Golcar United who were the current holders and who currently play in the West Riding Amateur League, sitting in 7th at the time of the game. The village of Shelly is home to just over 3000 people and won Calor Village of The Year in 2004. It is home to the Emley TV mast, the tallest free-standing structure in England which provides TV signals for the people of Yorkshire and beyond. Once again it was time for some Friday night football, having seen a game on almost every week this season. As is so often the case it was supposed to be the Eastern Counties League serving up the action, and it was a refreshing change from other leagues as none of the other has scheduled Friday games as much as these guys. 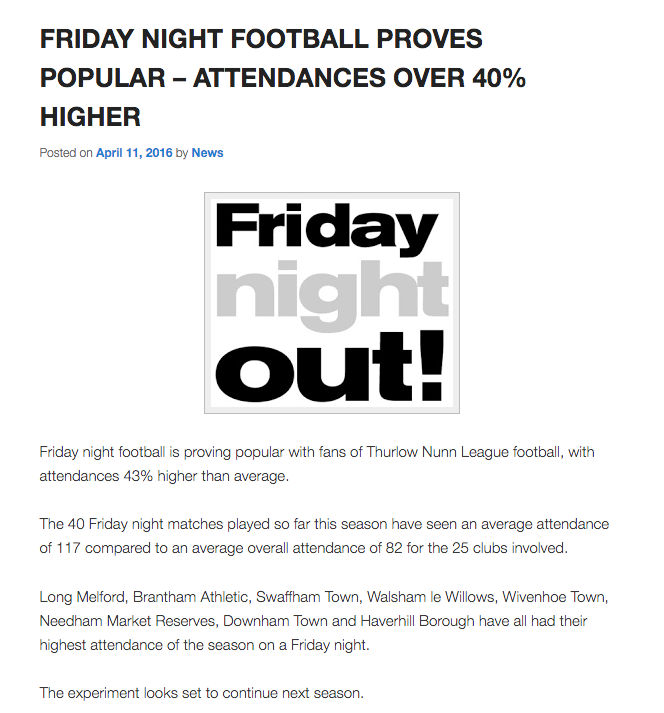 It had certainly helped their clubs with increased attendances and players and fans free to spend Saturdays doing as they pleased. Happily, I would have company again after a couple of groundhops on my own - Chris was back in the passenger seat after being unavailable for the past week or so. Strangely though, despite it being mid-April, it would be the second time this week that I'd had to change plans due to the weather. I first spotted there could be potential problems with my game at Walsham Le Willows on Thursday afternoon. After spending an hour setting up my blog by way of researching the clubs history. I then wished I hadn't bothered - I looked at the weather and with torrential rain all day in the East I knew in my heart of hearts that it would be game off. 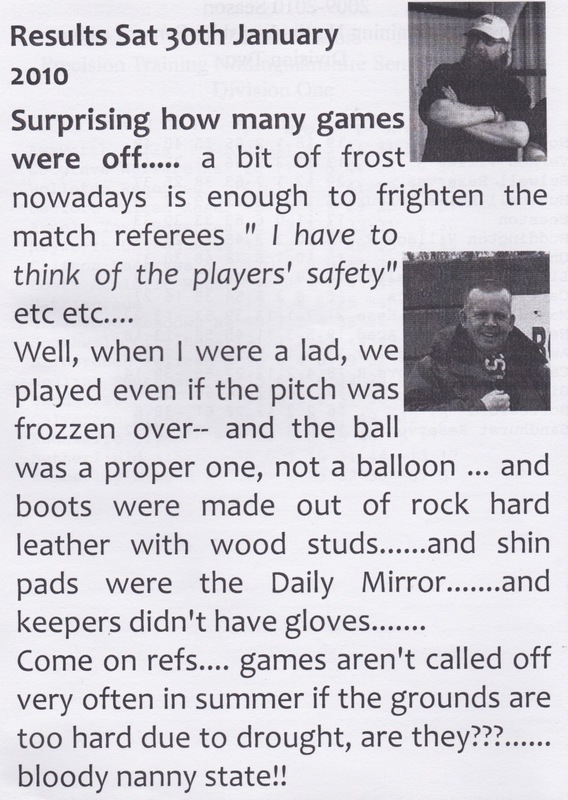 Justifiably so this time too probably, certainly referees seem all too keen to call games off at the drop of a hat these days - only that afternoon had I spotted an article in an old Kimberley Town programme about it. But even the best pitch in the world would find the going tough with that amount of water. The following day I was at work from 5-12, and after coming home and having lunch I started drawing up a list of alternatives. West Yorkshire League side Shelley were the top pick - I knew they had a very good pitch from weeks back when another multitude of postponements saw me make a late dash for Ossett Albion v Scarborough Athletic but Shelley was one of the games that survived the deluge that day. There was also a nearby cup final at Nostell Miners Welfare in Wakefield, a youth game at Harworth CI and further south a reserves game at Cotgrave in Nottinghamshire. Armed with my list of games I set off at 2.30 to meet Chris in Milton Keynes. I stopped at B&M Bargains in Aylesbury on the way to get some diet Irn-Bru and some mint poppets for the journey. Traffic in Aylesbury was the busiest I have ever seen it and turned out to be a sign of things to come for the trip up. I got to the meeting point a couple of minutes past 4 and after a brief discussion, we decided that Shelley would be the best bet. A call later on to their helpful secretary confirmed that the game was indeed on and it brought much relief to a frustrating journey. The problems started as soon as we hit the M1 with the queues starting a junction after we got on. It would be 90 minutes delay added to our journey. The main causes of the delays were miles of roadworks which are taking a disgracefully long time to complete and rubber-neckers gawping at accidents on the other side. I've never understood the logic of these utter cretins slowing down to look, surely you just want to get to tour destination as soon as possible. It left me extremely frustrated and briefly resolving to start a petition to introduce Sharia law for rubber-neckers. The last part of the journey was hindered by a police car travelling at a fraction of the speed limit but with another car between myself and him, there was no way I was going to be able to overtake. The game was watched by around 120 fans with me seeing fellow hopper Peter at the game. It had been a decent contest at a great club, though I hadn't enjoyed it as much as I could have due to not having any pre-match relaxation time. Myself and Chris were both still hungry and looking through my JustEat app I spotted a place that did curry pizzas. Always one who was keen to try something different I set my Sat Nav for there but when we arrived we discovered that it had closed at 9. Luckily there were a plethora of takeaways in the vicinity and we selected once called Pizza Shack for our post-match grub. 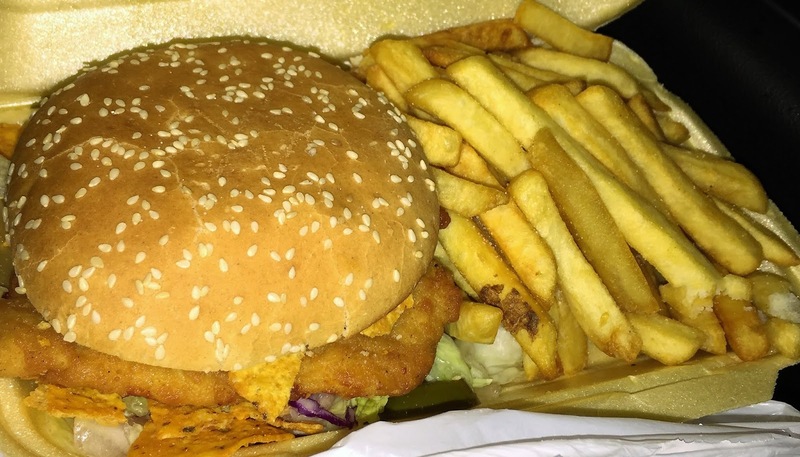 I still managed to have something interesting - a half pound Mexican burger which had jalapenos and tortilla chips inside along with some fries. Chris had a pizza and both happy with our meals and ready for the trip home we left Huddersfield at around 10.30. It was a long old journey home and very tiring through the roadworks with the 50MPH average speed check. Part of the M1 was closed for a junction so we stopped off at Rugby services for a rest. It was a weird old set up, a truckers place that looked like service stations did back in the 1980s but it did the job with me getting some chocolate to perk me up. For the last bit of the journey, we listened to Beatles Radio via my phone. I dropped Chris off in Wavendon at half midnight, getting home myself around 40 minutes later. I had a couple of ciders as I checked Facebook and watched Youtube videos and Coronation Street before going to sleep at around 3am, having been up and awake for nearly 24 hours. STORTHES HALL is an excellent ground for step 7. The main accommodation is on one side - benches cut into a bank with a couple of areas of cover. This side alone could probably hold around 1000 with around 400 of them under cover. The remaining 3 sides are uncovered flat standing. The ground is a fair walk from anywhere so it's just as well the facilities are half decent. The pork pies in the tea bar are excellent and various other stuff such as hot dogs are on offer. The bar is mainly cans with prices in line with what you would pay in a pub. 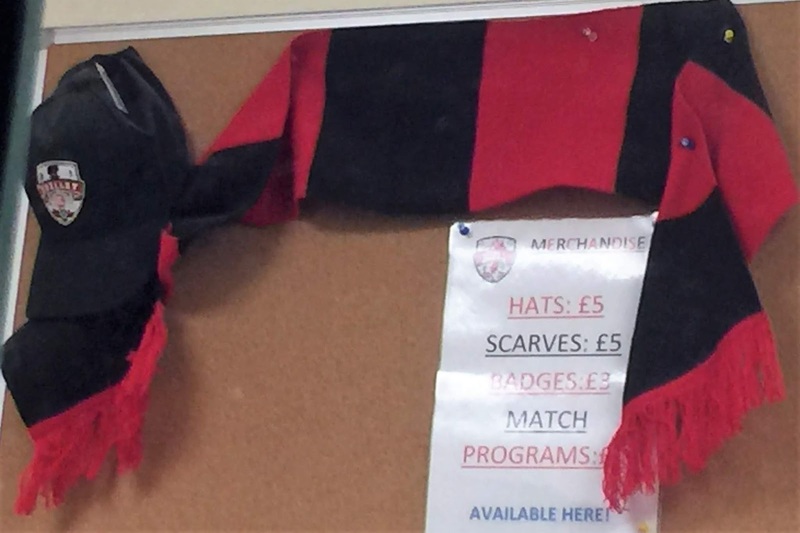 There is also a good range of merchandise with hats, scarves and pin badges available amongst other things.